A United Launch Alliance Atlas 5 rocket will send one of Viasat’s next-generation broadband satellites toward geostationary orbit from Cape Canaveral some time between 2020 and 2022, the companies announced Monday. The commercial satellite is one of at least three under development by Viasat to expand the telecom providers broadband reach beyond North America to the global market. Viasat says each satellite in its third-generation network, known as ViaSat 3, will provide more than a terabit per second of Ka-band network capacity. Under the terms of the contract announced Monday at Euroconsult’s World Satellite Business Week meeting in Paris, ULA will launch one of the ViaSat 3 satellites on an Atlas 5 rocket from Cape Canaveral, using the launcher’s most powerful variant with five strap-on solid rocket boosters. 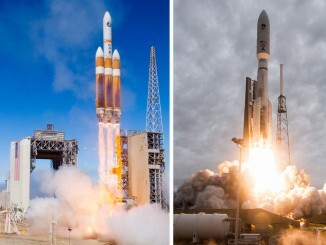 The financial value of the launch contract was not disclosed by ULA or Viasat. 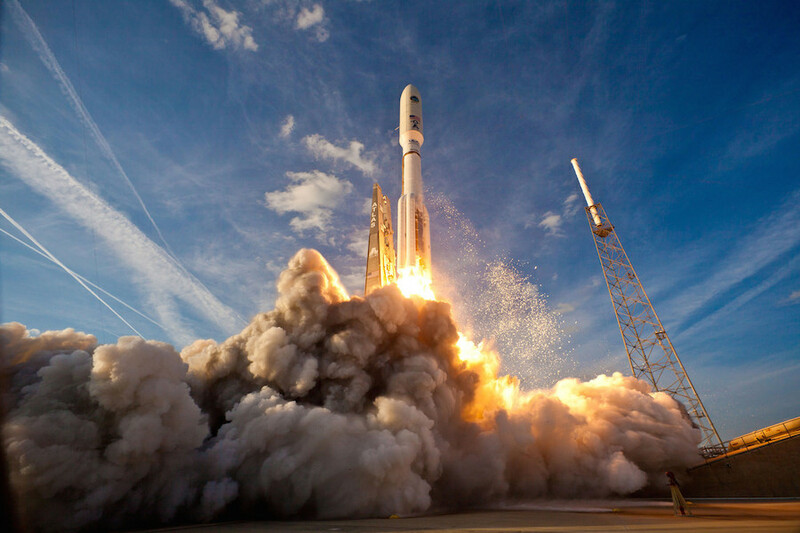 The launch booking is the first commercial contract for ULA since the launch operator took over responsibility for commercial marketing and sales of the Atlas 5 rocket from Lockheed Martin in January. The Atlas 5’s last launch with a commercial communications satellite was in 2016, with the EchoStar 19/Jupiter 2 broadband satellite for EchoStar and HughesNet, a competitor of Viasat in the space-to-ground broadband market. “ULA’s Atlas 5 launch vehicle is the most reliable launch vehicle in the world and we could not be more pleased that Viasat, a leading satellite broadband innovator, has recognized the value the Atlas 5 can offer, and decided to select this rocket to launch its critical commercial communications satellite,” said Tory Bruno, ULA’s president and CEO, in a press release announcing the contract. Viasat’s three new satellites will be parked in geostationary orbit over the equator, with coverage zones over the Americas, Europe, North Africa, and the Middle East, and the Asia-Pacific region. The first two ViaSat 3 satellites are under construction by Boeing, destined to fly over the Americas and Europe and North Africa. Satellites heading for geostationary orbit, a circular perch more than 22,000 miles (nearly 36,000 kilometers) above Earth, typically deploy from their launchers in an elliptical transfer orbit, then maneuver into their final position with on-board propulsion. 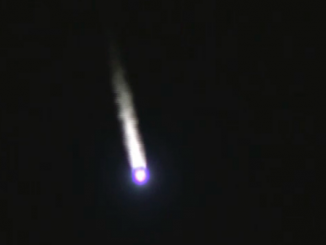 The ViaSat 3 satellites will carry plasma thrusters, a fuel-efficient but low-thrust system that can typically take up to six months to make the journey from a transfer orbit to geostationary orbit. Viasat expects that time will be reduced by the Atlas 5 rocket, which can place the satellite closer to its final orbit, reducing the time needed for orbit-raising and accelerating the spacecraft’s entry into commercial service. 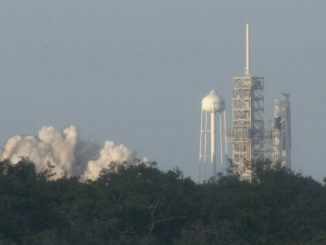 One of the ViaSat 3 satellites is reserved to launch from French Guiana on an Ariane 5 rocket, and Viasat could use SpaceX’s Falcon Heavy to launch another ViaSat 3 spacecraft, converting a previous launch contract for the ViaSat 2 satellite, which the broadband provider switched to an Ariane 5 rocket after Falcon Heavy development delays. Viasat has not determined which ViaSat 3 satellite will launch on each rocket, preferring to keep options open based on market demands and launch availability. Viasat officials emphasized the importance of using a diverse set of launchers in the ViaSat 3 satellite deployments. “The selection of Atlas 5 for one of the ViaSat 3 missions is the next step in implementing Viasat’s integrated launch strategy which is designed to ensure the on-time launch of all of the ViaSat 3 spacecraft through launch vehicle diversity and an integrated approach to launch planning,” ULA and Viasat said in a press release.